Created to withstand a lifetime of gamingThe CORSAIR K70 RGB MK.2 SE is an amazing mechanical gaming keyboard built for gamers who crave for a unique style and high performance. Designed for resilience with a silver aluminium frame, CHERRY MX Speed keyswitches and white double-shot keycaps, this distinctive keyboard combines durability and accuracy that meets your expectations. CORSAIR iCUE software enables sophisticated macro programming, multicolour illumination and full-system lighting synchronization. With a host of tools, your PC setup is truly at your fingertips with a USB pass-through, 8MB profile storage, and a removable soft-touch wrist rest, making it simple to play your way. RAPIDFIRE ADVANTAGE DURING GAMING Built in Germany and used by the pros, Cherry MX gaming key switches feature the world’s leading mechanical switch technology. Gold-crosspoint contacts, gold-plated contact closures, and pressure-resistant metal alloy springs give every gamer a competitive advantage. Unleash blistering speed with the 1.2mm mechanical actuation and durability of Gold contact Cherry MX mechanical gaming key switches. Wield the ultimate performance advantage over your opponents with light operation 45g key switches and an actuation 40% faster than standard Cherry MX Red switches. 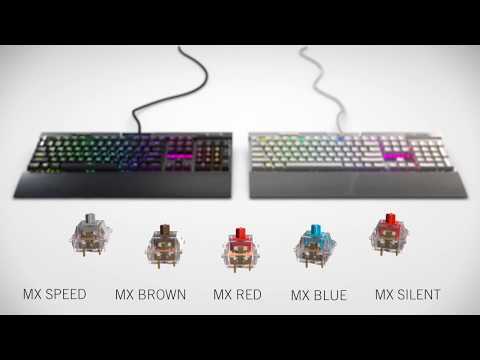 Dynamic Multicolour Per-Key Backlighting The K70 RGB MK.2 SE mechanical keyboard allows gamers to set the atmosphere for every game with RGB per-key backlighting, offering near infinite colour customisation and control. CORSAIR iCUE software allows full access for colourful dynamic RGB lighting, sophisticated macro programming and full-system lighting synchronization, compatible with other CORSAIR products including peripherals, coolers, fans, and more. Play your way with 8MB profile storage with hardware playback, which allows access up to three stored profiles on the go, independent of external software. WINDOWS KEY LOCK MODE Make on-the-fly audio adjustments without interrupting your game. When you’re not competing, the controls can provide an easy way to play, pause, and skip audio tracks. With the smart windows lock mode you can stay in the game and avoid accidental Windows and Context Menu key presses. DESIGNED FOR CONVENIENCE Discover convenient access to an additional USB port for your mouse or headset. The Corsair K70 MK2 SE features a handy USB port on the back of your keyboard so you can easily plug/unplug your devices with minimal effort. DETACHABLE SOFT-TOUCH WRIST REST The K70 RGB MK.2 SE gaming keyboard features a textured soft-touch wrist rest to provide just the right amount of grip to keep your hands in place and provide long-lasting comfort to enhance your experience for long gaming sessions. ANTI-GHOSTING TECHNOLOGY Textured and contoured FPS and MOBA keycaps sets provide maximum grip and an enhanced typing experience. Featuring an incredible 100% anti-ghosting with full-key rollover, no matter how fast your in-game actions are every keypress registers with pinpoint accuracy. ROBUST AND BUILT TO LAST The K70 RGB MK.2 gaming keyboard is designed with an aircraft-grade brushed anodized aluminium frame, which provides lightweight and robust durability, built to last thousands of hours of gameplay. Will this be the standard UK layout, as the picture shows a US layout, not UK?